Over/Under: Under 171.5 at 1.90 Bet Now! The second game of the 2016 Olympic Men’s Basketball tournament in Rio sees the favourite enter the fray but this should be a simple and relaxing game for USA. You have the top seed versus the bottom seed in this game and the only real chance of a shock will come in the Americans not scoring as many points as people predict them to. This may be a chance for the Americans to utilise their squad and give people plenty of game time but when it comes to ensuring people are match-fit and ready for the effort a summer tournament, Team USA couldn’t have selected a better opening match. 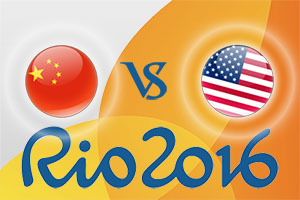 It is a shame that so little focus will fall on China, but it should be remembered that this is a massive game for them. For their players, it is an opportunity to pit their wits against some of the best basketball players on earth at a major tournament. This can sometimes propel players to new heights and while they are likely to be outclassed in the effort, it is unlikely that the Chinese side will be lacking in effort or energy. If you are looking for potential key players in the US side, take your pick! Kevin Durant, Kyrie Irving and Carmelo Anthony are all hot tips to be the leading point scorer in the tournament and they’ll be keen to boost their tally in the opening game. For China, Wang Zhelin has been snapped up by the Memphis Grizzlies in the 2016 Draft, so he could be the man that Chinese hopes will rest on. Zhelin will return to the Chinese domestic scene in the new season but there are high hopes surrounding this player. The Americans will win this game but as this is the game of their life for many Chinese players and the Americans may be keen to build up into the tournament, taking China at +50.5, at odds of 1.90 could be a good start to the tournament. In the Over/Under market, look to go UNDER 171.5, which you can find on offer at 1.90. Bet Now! The bookies have decided that there isn’t any real value (for them at least) in offering many prop bets for this game. The only options you can currently find are based on whether the first quarter and half-time scores will be odd or even. There may be similar best regarding team scores and full-time score added to the betting slips before the game begins but these are all akin to a flip of a coin, so focus on the game lines in this match. This game starts at 23.00 BST on Saturday the 6th of August.